This piece was birthed from my thoughts about Len Bias, and the events that have ensued. If it seems random you just have to follow my thought pattern. My heart is Maryland. My soul is D.C., but my heart is Maryland. I love everything about it, Especially the sports teams. Maryland basketball has been the only collegiate basketball I really follow on a consistent basis. The ESPN documentary "Without Bias" based on the events in the life and tragic death of Len Bias resonated with me. The story is so real and so palpable in every way. There was a chain of events that weaved and linked into the events of today. Amid pressure of scandal and investigation into his knowledge of his players using cocaine, longtime coach Lefty Driesell resigned from the position he held for 17 years. His successor Gary Williams has been pacing the sidelines at College Park ever since. 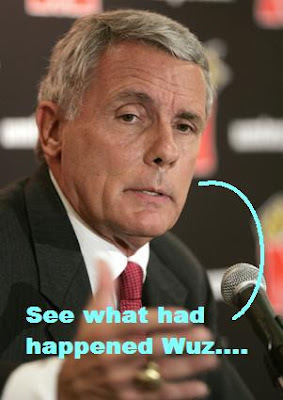 Gary has taken the Terrapins to the Final Four twice, and in 2002 won the National Championship with a bunch of overlooked, "under talented" players. I mean, Juan Dixon, Steve Blake, Byron Mutton, Chris Wilcox and Lonny Baxter aren't your normal band of players with extreme talent. But Gary knew what he was working with, and made the right moves (along with the heart of his players) to win that lone National Championship. In the years since then, the Williams train has traveled down the tracks of mediocrity. There has been player after player, who has suffered from JDS (Juan Dixon Syndrome) where they matriculate from Maryland only to either not be relevant or have minor success in the NBA. John Gilchrist, Drew Nicholas, Nick Caner-Medley, Darryl Strawberry Jr., all have passed through Maryland and have nothing really to show for it professionally. Steve Blake has been the most productive Terrapin since Steve Francis. But why hasn't Gary broken into the well of upper echelon talent the DMV has to offer? Well his main flaw is his refusal to recruit out of AAU. Let's put things in perspective here. The list of DMV talent that has passed by Mr. Williams (or he didn't recruit fully) includes Rudy Gay, Kevin Durant, Michael Beasley, Jeff green, Roy Hibbert, Joey Dorsey, DaJuan Summers, Scottie Reynolds, Ty Lawson, and Jack McClinton. I purposely left Carmelo Anthony off that list because that story sums up the whole point (he was recruited by Maryland, and wanted to attend, but they instead went with Caner-Medley. Anthony won the championship that year with Syracuse). Gary may have looked at these kids, but didn't follow through or seriously recruit them. Yes, Greivis Vasquez was his choice out of Montrose Christian when Kevin Durant came from the same school. In order for Maryland to once again become a force in collegiate basketball Gary must realize that AAU is the place where most talent lies and begin to harness that talent. He must build a report with AAU coaches and change the perception he has around those inner circles of the AAU. Williams couldn't even sign his latest recruit and New York sensation Lance Stephenson. I mean, its not like he can't fine talent. Maryland just signed Center Jordan Williams, who did this. I understand Gary is a purist, and that is great but one must realize when he must alter his thinking in order to achieve the goals they set out to do. All local talent plays AAU. Hell, I played AAU with the creator of this blog. If Gary is to keep his job in the coming years he has to recognize that and delve into the ocean of talent that DC, Maryland, and Virginia is producing. Until then, that lonely Crystal Trophy in a glass case at Comcast Center will never see a twin. Lance has amazing basketball talent, but he cant seem to stay away from trouble off the court. He could become an NBA legend, or he could fall into obscurity as another cautionary tale, it will be interesting to see how this pans out. Lance has not lived up to expectations thus far, but its only a few games in. I think John Wall has the talent to be an All-American this year as a freshman.